Jakob Jespersen, member of Lage Lab at MGH and the Broad Institute, presented at the Center for Mendelian Genetics Analysis meeting the Interpretation of missense variants using protein structures and features. Jakob explained that with a vast amount of exome sequencing data, it is difficult to identify the missense variants that may be implicated in diseases. While it is possible to crudely classify variants as “loss of function” based on observations such as the mutation being in a splice site, creating a stop codon or frameshift, it is much more difficult to determine whether missense mutations are deleterious or benign. Since the Protein Data Bank (PDB) hosts information on more than 6,000 different human proteins, it is possible to add structural information to help the classification of missense mutations. Some methods are already utilizing features from 3D protein structures, so the presentation was focused on features that we can extract and calculate which are not in use yet as well as a computational tool set Jakob has developed for this purpose. On June 23rd and 24th Kasper was invited for a two day visit to the Jackson Laboratory for Genomic Medicine in Conneticut where he presented his labs work. During this time he met with the Institute’s Leadership (Edison Liu and Charles Lee) as well as with the impressive young faculty of this newly created research site. Edyta Malolepsza, April Kim and Kasper Lage attended the annual meeting of the “The Lundbeck Foundation Initiative for Integrative Psychiatric Research” – iPSYCH – consortium June 1st to 4th where Kasper was invited to give a Keynote Address titled ‘Human Brain Networks Perturbed by Genetics and Targeted by Therapeutics in Psychiatric Disorders. For more information about the iPSYCH meeting click here. From the iPSYCH website (http://ipsych.au.dk/): “The Lundbeck Foundation Initiative for Integrative Psychiatric Research” – iPSYCH project will study five specific mental disorders; autism, Attention Deficit Hyperactive Disorder (ADHD), schizophrenia, bipolar disorder and depression. All disorders are associated with major human and societal costs all over the world. The project will study these disorders from many different angles, ranging from genes and cells to population studies, from fetus to adult, from cause to symptoms of the disorder, and this knowledge will be combined in new ways across scientific fields. The main goals are to identify the causes of these disorders by studying the genetic and environmental factors. The perspective is to offer better and more personalized treatment, providing a better life for each individual patient – and perhaps even ways to prevent the development of the disorder in some cases. Kasper presented the labs work on this two day meeting on the Biogen Campus in Cambridge US. Informatics, Genetics and Genomics for Target Selection and Validation – Cambridge, MA, USA. Kasper presented the labs work on neurological diseases and participated in brainstorming sessions on new ways to tackle neurological diseases this two-day meeting at the Google Headquarters on Kendall Square in Cambridge (USA). 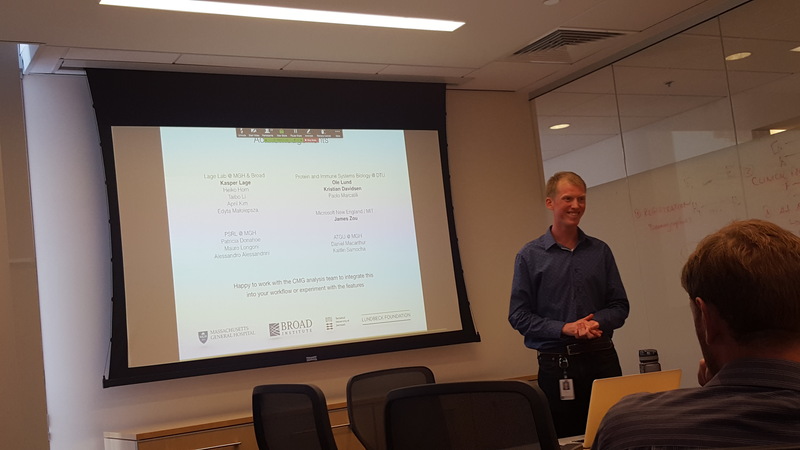 Kasper presented the labs work on psychiatric diseases at the two-day meeting of the Scientific Advisory Board of the Stanley Center for Psychiatric Research at the Broad Institute.